In August of 1977, David Berkowitz was arrested for the “Son of Sam” murders — so-called due to a bizarre note found at one murder scene. He admitted to the killings, claiming that his crimes were ordered by a demon (a black lab named Harvey) kept by his neighbor (Sam). The outlandish confession caught the public’s attention by the throat, fueling debates about legal insanity and inspiring laws to prevent convicted criminals from selling their stories. I would contend that it also planted the idea of demonic canines in the fertile imaginations of writers. 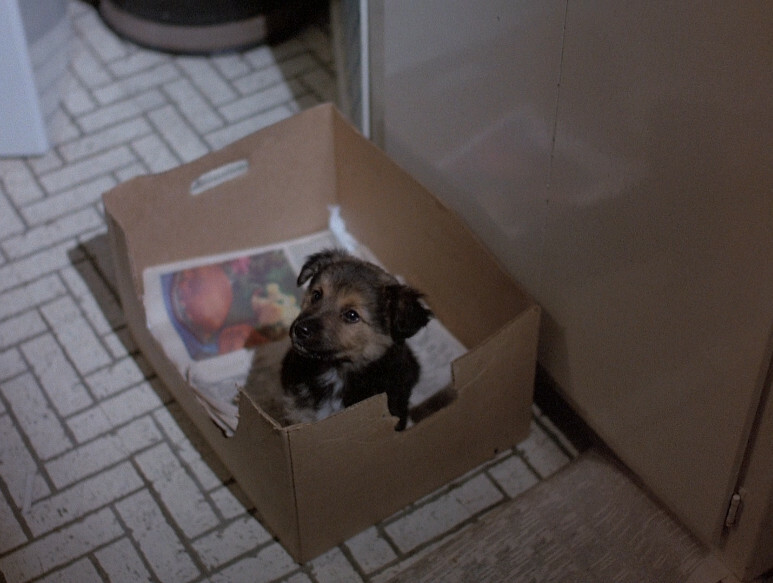 The following year saw the release of Albert Band’s Dracula’s Dog , and only three years later Stephen King unleashed Cujo . Yet the most explicit connection to Harvey the demon pooch is Lucky, the cuddly threat of Devil Dog: The Hound of Hell . 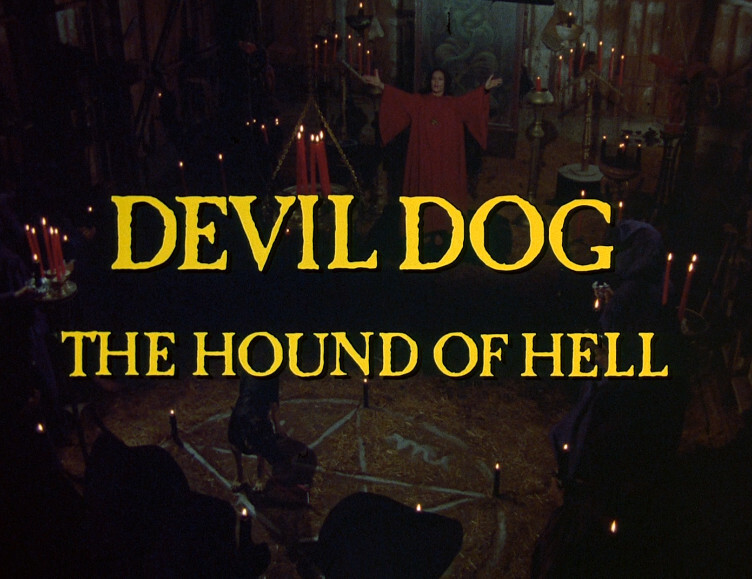 Filmed for television, Devil Dog first aired on Halloween in 1978. It’s a good feature to hand out candy during, being both fairly ridiculous and sporadically interesting. The premise is that a satanic cult distributes demonic puppies to unsuspecting suburban families. Once established within middle-American families, the pups corrupt their homes. The details are vague, but somehow this scheme aims to break the Beast’s 1,000 year confinement. I took careful notes, but I’m afraid it defies all attempts at logic. The cultists first acquire a proven breeder dog. They want her immediately, and she must be in season as it were. They’ve had an entire millennium to prepare for this, but some people will always leave everything to the last minute. The next step is to summon a barghest in a dark ritual. (A barghest is a mythical creature from Northern England that takes the form of a large black dog.) From such humble beginnings, more barghest pups are sired. Once weaned, the creatures will spread corruption. There’s a missing step that connects that to the final step in their plan, wherein the Beast roams the Earth. More on this confusion later. The film follows the Barry family, who’ve taken a young demon puppy into their home after the suspiciously-timed death of the family dog. Specifically it follows Mike Barry as Lucky collects the souls of his family. Mike is played by veteran actor Richard Crenna, whose professionalism helps ground the film. The Barry children are portrayed by Kim Richards and Ike Eisenmann, the young stars of Escape to Witch Mountain and Return to Witch Mountain . Their comfort with each other and experience working with animals come through here, lending credence to some rather unusual moments. Indeed, the pair of them are often more threatening than the barghest. It might be easier to list what’s less terrifying than a puppy. The family barghest is first played by an absolutely adorable puppy. Despite the best efforts to splice shots of Lucky into horrific events, it only serves to undercut the tension and danger. Sure, someone’s burning to death, but look at that sweet face! The adult Lucky is a little less cute but still appears friendly. There’s hardly a shot of the dog where its tongue isn’t hanging out, and sometimes the embodiment of evil sits on its right haunch as though unwilling to fully commit to the corruption of the nuclear family. When the barghest’s true form is revealed to be Lucky in dark paint and a black feather boa, you have to give credit for simply trying anything. Part of the difficulty of making the dog scary also lies with the jumbled mythology that’s presented. The use of a barghest is pretty cool and should be enough to carry a horror movie in itself, but the demon litter is supposed to lead to the release of the Beast. At times this seems to be the Beast from Revelations, but it’s also a non-specific 3-eyed demon. The children draw it in blood, but when shown this portrait an occultist’s only observation is that 3-eyed ones are clever. A photo of an entirely dissimilar demon drawn on a cliff sends Mike to Ecuador, where a shaman ties it all back to Revelations again. What nobody manages to do is explain what the barghest has to do with anything. A less apocalyptic plot could have helped focus the story and create some actual tension. Another detriment to establishing any sense of danger is that nearly every event in the movie is completely self-contained. Aside from the presence of the barghest and the corruption of the family, much of the film is comprised of plot chunks so complete and modular that they could be removed without any damage to the structure. One notable example is the matter of the school election. In one scene, we learn that young Charlie is running for class president. In the next scene, a teacher comes to say that he’s concerned about how Charlie won (by framing his opponent for stealing). Then Lucky kills the teacher. Most of the supporting roles follow this pattern, with the characters being introduced and discarded within minutes. While this doesn’t add up to a good movie, it is an enjoyable one. The episodic construction means that something new and different happens every ten minutes, which helps keep it fresh. It also allows whole sections to be missed with little cost to comprehension. 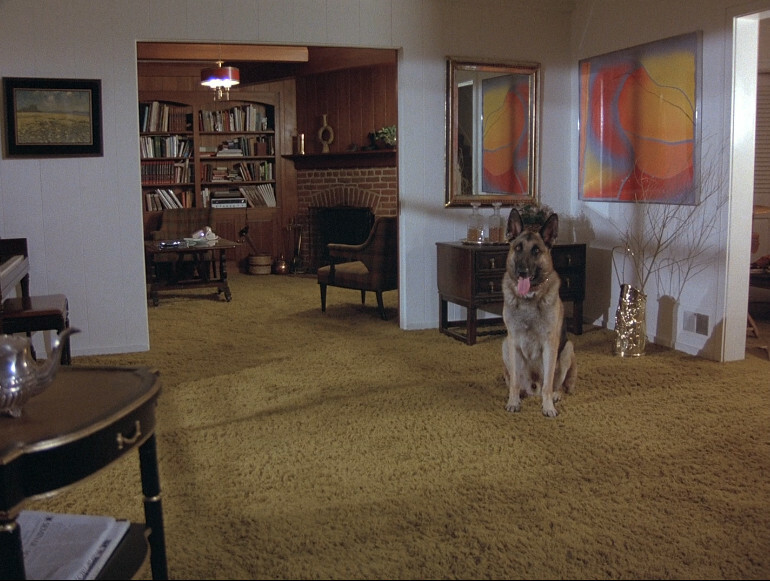 Watching the actors come and go is entertaining, and it’s just plain fun to see the dog be utterly harmless. I would be remiss if I neglected to mention the scene that directly connects the film to David Berkowitz’s confession. While Mike is considering whether he can actually believe that the family dog has been turning everyone into Satan’s tools, he catches an item on the news that seems connected. A reporter is interviewing a woman whose husband has just been arrested for murder. According to her, her husband had claimed that the dog next door had made him do it. Airing just over a year after Berkowitz’s arrest, this is no coincidence. Ultimately, that may be the most compelling reason to watch this — to see the slap-dash TV cash-in of the “Son of Sam” confession.